Jeffery asked the woman who ran the little wineshop that stood on the southern edge of the Latin Quarter whether she knew of a nearby location where our purchases could be enjoyed. His French was very poor, and he was forced to repeat himself using several word variations. Finally she understood and said something that he could not translate. 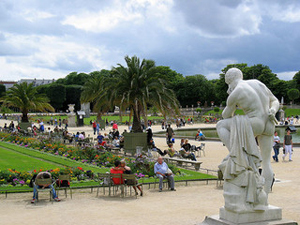 She laughed and said in English, “The gardens,” then pointed west toward the Boulevard Saint-Michel. 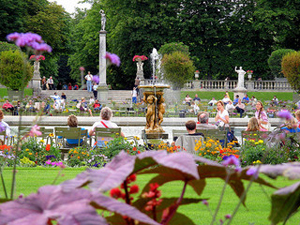 I had only been in Paris for a few days, but I realized that she meant the Luxembourg Gardens, a place that had been recommended to me but which I had not yet visited. The wine-seller had somehow talked us into purchasing three bottles of red that were definitely out of our price range, and we wanted to find someplace where we could properly partake in our extravagance. The gardens sounded like a fine choice, so we bid our adieus and gathered our bottles to leave. The woman suddenly clucked her tongue and asked something that Jeffery’s subpar French could not decipher. She picked up one of the bottles and made a motion as if drawing the cork. We got her point and indicated that we did not have a corkscrew, so she produced one and proceeded to draw the corks from each bottle to the point where they could easily be removed by hand. We did not have much trouble finding the park, and as we made our way around the towering wrought iron fence that encircled it, I became increasingly excited at the prospect of spending the afternoon wandering its grounds. From what I could tell, the park contained a grove of trees the likes of which, one could not find in any other part of Paris. From behind the fence I spied a series of paths that were dotted with the occasional statue. Eventually we found an entrance and began meandering along the graveled walkways. 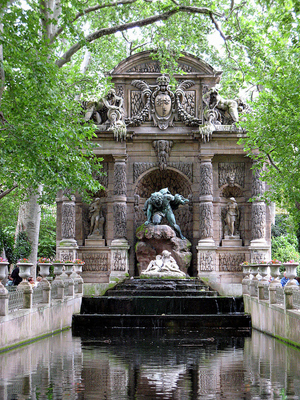 The grounds are the home of a good number of statues which include busts of some of France’s greatest heroes and a variety of animals. We passed a small scale Statue of Liberty. The bronze figure of Beethoven. The heads of Baudelaire, Verlaine, and Hercules. At one point the paths intersected at a towering Elk; at another, a lion. In the southwestern corner we found a grouping of fruit trees. Nearby was found a playground and a little stage where puppet shows are presented on occasion. After some time was spent wandering the grounds, we decided to locate a place to sit and enjoy our wine. We made our way toward the grassy area that spread out below the Luxembourg Palace, which is the house of the French Senate. The open spaces were thick with crowds of sunbathers who represented virtually every nation. Eventually we found a place to sit in the grass where we could take in the view which was pleasant indeed, comprising of children playing with toy sailboats in the fountain, the Palace and its surrounding statues, and a good number of beautiful, bikinied French girls. We opened the first bottle of wine and talked for a while and praised the wine and pointed out girls and dared one another to approach this one or that. At times the atmosphere in the park was charged with energy as games of catch or frisbee popped up, but for the most part, it was quiet, calm, and provided a refreshing escape from the hurriedness of the rest of the city. We talked until we ran out of things to say, then took out our books and I read A Farewell to Arms while Jeffery read Tropic of Cancer. The first wine bottle emptied, and about halfway through the second I put my book back in my bag and took up my pen and notebook to record what had happened over past few days. Jeffery had fallen asleep and I had run out of things to write, so I went back to reading. The second bottle emptied, and as I produced the third bottle from my bag, I heard a feminine voice behind me. I turned and smiling down at me were two undeniably gorgeous girls, one blonde and one brunette. I smiled back and the blonde one addressed me in sharply accented English. He eyed them with mock suspicion. “How much is left? One bottle…” He hesitated, “Well, I suppose we can always get more.” We could not as we were broke, but the girls did not know this. They joined us on the grass and we learned that they were Dutch. The last bottle went quickly, but Jeffery had already worked up a scheme to procure a few more from an acquaintance of ours. We asked the girls if they would join us, and they consented. As we made our way toward the entrance the blonde girl and I fell back a bit from the others and talked about what it had been like in the countries we had left. At some point I said something that must have struck her as humorous. She laughed and I felt her hand foldinto mine.